A machine vision system for part identification and recognition reads barcodes (1-D), data matrix codes (2-D), direct part marks (DPM), and characters printed on parts, labels, and packages. An optical character recognition (OCR) system reads alphanumeric characters without prior knowledge, whereas an optical character verification (OCV) system confirms the presence of a character string. Additionally, machine vision systems can identify parts by locating a unique pattern or identify items based on color, shape, or size. DPM applications mark a code or character string directly on to the part. Manufacturers in all industries commonly use this technique for error-proofing, enabling efficient containment strategies, monitoring process control and quality-control metrics, and quantifying problematic areas in a plant such as bottlenecks. Traceability by direct part marking improves asset tracking and part authenticity verification. It also provides unit-level data to drive superior technical support and warranty repair service by documenting the genealogy of the parts in a sub-assembly that make up the finished product. Conventional barcodes have gained wide acceptance for retail checkout and inventory control. 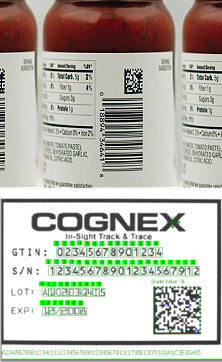 Traceability information, however, requires more data than can fit in a standard barcode. To increase the data capacity, companies developed 2-D codes, such as Data Matrix, which can store more information, including manufacturer, product identification, lot number, and even a unique serial number for virtually any finished good. Industrial barcode readers quickly decode DPM codes and challenging label-based barcodes.